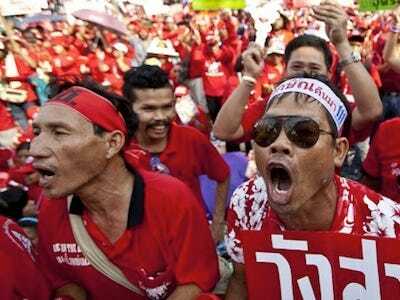 Is it Class Warfare in Thailand? The political situation in Thailand seems to settle down after months of street protest. It is, however, impossible to assume this is the end of the problem in the Kingdom. In the eyes of the international political analysts and media, theyhave depicted the round of protests as class warfare and describe red-shirt protestors as ordinary people or "prai', a feudal word meaning the rights of commoners or lower-class citizens. For Thais, this term symbolizes the hierarchy in the contemporary Thai society. "Prai' represented those from low socio-economic background with poor education and less economic power. The "prai' discourse is one of the very strong messages in the Thai political history. It unifies the large group of the citizen who perceive themselves at the bottom of the Thai social system. They are working-class people who are touched by Peonism-style policies from former Prime Minister Thaksin Shinawatra who was ousted in a coup in 2006. To encourage the majority of the Thai citizens, mostly from the North-Eastern Thailand, who have long lived in poor conditions and have lacked opportunities, to actively support the red shirts, the "prai' discourse has been strategically created by the ousted PM Thaksin Shinawatra. Like most developing nations in South East Asia, Thailand has long suffered from chronic social problems stemming from corruption, social inequity based on the economic and educational gaps between the rich and the poor. The leaders of red-shirt protestors also utilised term "amataya',' the association with the nobles or the bureaucrats, to describe the current government. The image of an Oxford graduate and noble family background of the current PM Abhisit Vejjajiva (and some of his Ministers who grew up in the UK or America) emphasized the elite status of the current government as the elite government, by and for the rich, supported by well-educated Thai bureaucrats. The strategic message that the ousted PM Thaksin Shinawatra send to Thailand is that the current government does not represent the poor. He claims that the current political protest in Thailand has gone beyond a simple fight between his supporters and his opponents. It is a war between Mr. Shinawatra, the leader of the 'prai', and the current government, the elite or 'amartaya'. Let us examine this in a little more detail. Is this a fight for social equity between the "prai' and the "amataya'? Thaksin Shinawatra is a classic example of a person from an upper class background who has had the opportunity to complete his PhD. from America. He, who claims to fight for citizens from lower socio-economic backgrounds, once was claimed to be the richest man in the nation and was, himself, a member of the elite. He once was the owner of the Manchester City soccer team in the UK. Thaksin clearly does not represent the poor. He has been seen as the leader of the poor because he comprehends the concept of consumer behaviour from the political point of view. While in power, most of his projects that focussed on supporting the poor in rural areas were heavily criticized for their lack of long-term benefits. Questions were asked about where any profits would go. During his era, debt levels in the northeast doubled to an average of about 100,000 baht ($3,000) per family. Today, most Thai rural families still carry this unpaid debt. Clearly, the political situation in Thailand is neither the fight between the rich and the poor nor the conflict between the elitists and the farmers. In fact, it has been cleverly manipulated by the elites. The poor, the key population of Thailand, remain (and will remain) in their "lower caste" as long as the government do not support them with any long-term human development strategies. Thaksin was nearly a perfect leader to Thailand because of some of his clever policies that focused on social development and poverty eradication. However, for most Thais, problems on corruption, nepotism, human rights violation and unfair competition were too serious to let him and his party govern Thailand. At present, the dissolution of the parliament is the key condition that the red-shirt people' proposed to PM Abhisit Vejjajiva and his cabinet. The red-shirt protestors criticised Abhisit lacks a popular mandate after coming to power in 2008 parliamentary vote following court ruling that dissolved a pro-Thaksin ruling party. He can show his true leadership by calling for a new election in the near future. A new election might be one way to equalise the power between the poor and the rich. Come what may, the next PM of Thailand must address the issue of "social equity" and show the political spirit to support Thai citizens from all walks of life. Trust, sincerity, and love of the people,to me, are the way to improve the situation in Thailand.